Roger Vivier (1913-98) was a designer of luxury shoes, and is credited with creating the stiletto heel. He designed for several couturiers, including Elsa Schiaparelli in the 1930s, but notably for Christian Dior from 1953-63. He is the only one of Dior's collaborators permitted to have a credit on the final design - 'Christian Dior crée par Roger Vivier' - which is marked inside every shoe. He worked in elaborate and expensive materials including silks, pearls, beads, lace, metal threads and jewels. 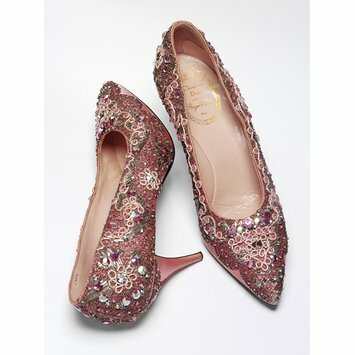 Pair of pink silk satin shoes with high heels. Embroidered with beads, gilt thread, rhinestones and pink brilliants. Pointed toe and high stiletto heels. Roger Vivier (1913-98) was the designer of luxury shoe designer. He is credited with creating the Stiletto heel. He designed for several couturiers, including Schiaparelli in the 1930s, but notably designed for Dior from 1953-63. He is the only one of Dior's collaborators permitted to have a credit on the final design: 'Christian Dior crée par Roger Vivier'. The highly decorated shoes by designer Roger Vivier for Christian Dior in the 1950s and early ’60s represent the ultimate in luxury footwear. Only the wealthiest members of society could afford Dior’s accessories and gowns. 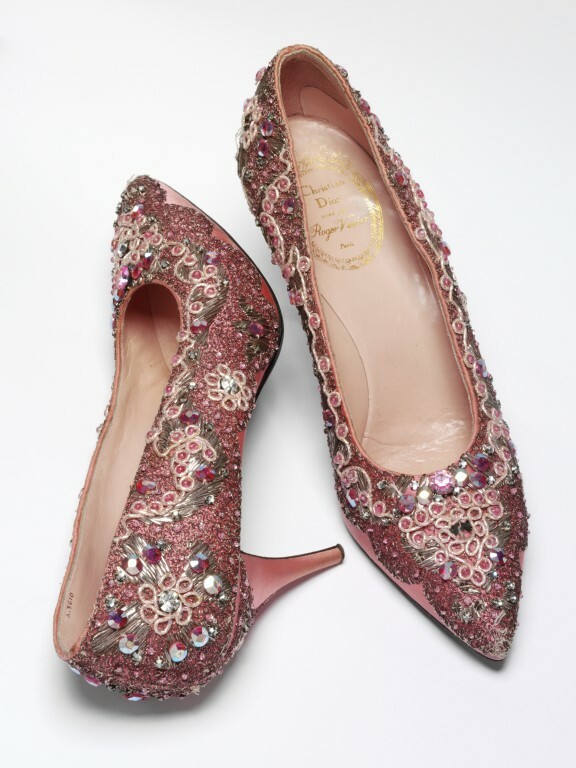 The donor and wearer of these shoes, Mrs Gloria Loel Guinness, belonged to one of Europe’s richest families. Roger Vivier started working for Elsa Schiaparelli in the 1930s, when his designs were considered shocking by major retailers. He went on to collaborate with many couturiers to create shoes for their collections and started collaborating with Dior when the New Look brought emphasis to the ankle and foot. Vivier created a number of innovative heel shapes for Dior, including the comma heel and the stiletto.